Do you want to be wearing the same clothes ten years from now — the exact same clothes that you have in the closet right now? How Many Books = Too Many Books? The simple answer for books is the same as in any area of possessions: keep only the books that you are likely to read again or otherwise use in the future. But for book collectors, the answer is rarely this simple, as you can see in the comments on the post at the link above. 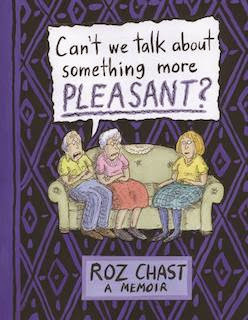 The question “Can’t we talk about something more pleasant?” forms the title of a new book by Roz Chast. I haven’t seen the book myself, but I am told that the title refers to the touchy question Roz asked her aging parents about what would happen to all of their stuff when they were no longer around to watch over it. It was a subject they ultimately never could bring themselves to address. That’s a common story, of course, and not just among those of us who are getting old. Most people living a middle-class lifestyle have several times more possessions than they can realistically ever use. Most of it, logically, is clutter, and should be taken away in way or another. Unfortunately, it is easier to postpone the question of which part is actually excess. It’s a subject that can wait until after we are done with whatever we are in the middle of this week, and in practice, that means it can wait indefinitely, or at least until the next time we move.